This annual review provides evidence based analysis and insight to shed light on the progress, projections and priorities for the UK’s top food service management (FSM) businesses, and the importance of the contract catering industry to the UK economy. 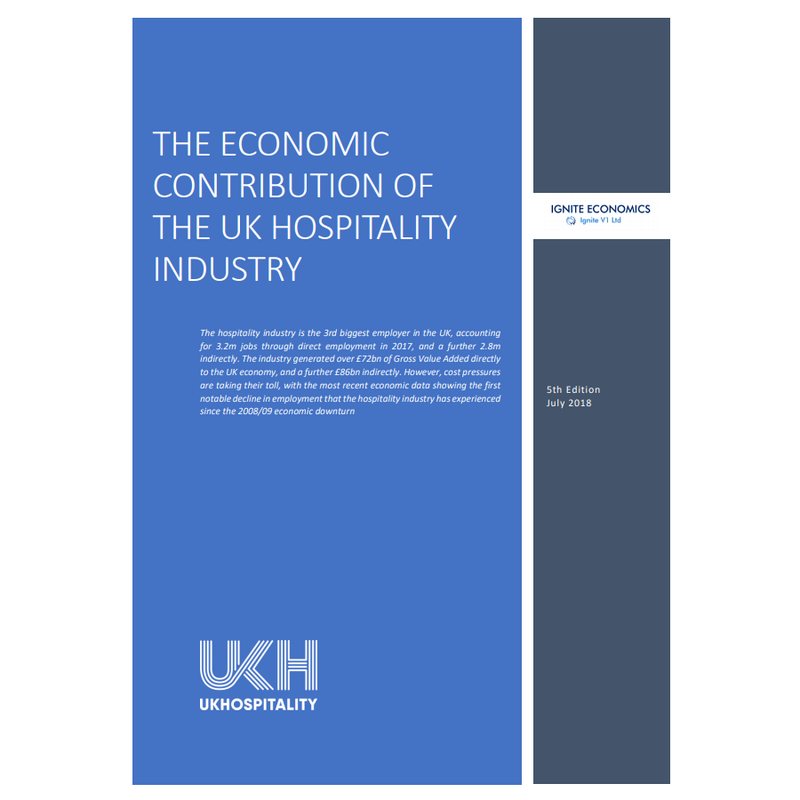 Ignite Economics provides analysis of the hospitality industry which is the 3rd biggest employer in the UK, accounting for 3.2m jobs through direct employment in 2017, and a further 2.8m indirectly. The industry generated over £72bn of Gross Value Added directly to the UK economy, and a further £86bn indirectly. However, cost pressures are taking their toll, with the most recent economic data showing the first notable decline in employment that the hospitality industry has experienced since the 2008/09 economic downturn. 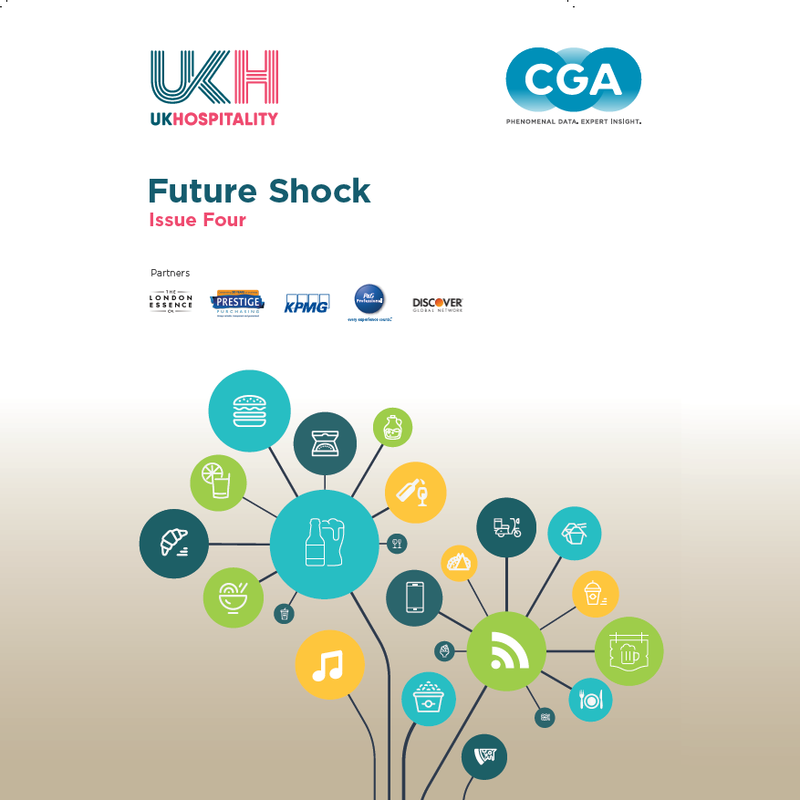 Future Shock is UKHospitality's first exclusive market report and is produced in collaboration between UKHospitality, CGA and partners. It forms part of a series of market reports previously produced by UKHospitality predecessor ALMR and is now in its fourth edition. Key findings of the report flags the big issues, challenges and opportunities to track in out-of-home eating and drinking. Rising costs, intense competition and Brexit are creating significant challenges for operators in the out-of-home eating and drinking sector—but consumer trends including premiumisation and healthier eating and drinking offer opportunities for growth. The UK Hospitality Workforce Commission 2030 was established to identify the strengths and weaknesses of the sector and give employers an opportunity to communicate this to Parliamentarians. A new think tank report by Sky and UKHospitality, has hailed technology as essential in creating a defining home-away-from-home experience, with WI-FI and TV topping the list of must-have amenities. The future of payments lies with all-inclusive ecosystems where payments are simple to make, immediate, and are fully integrated into the overall context. Future of Payments is a new think tank report by Discover Global Network and the BHA, now UKHospitality. The relentlessly fast growth of the online marketplace means that regulations have not kept up with new ways of doing business. UKHospitality is concerned about the lack of transparency for the consumer and the potential for very large global digital firms to stifle hospitality businesses’ growth, over 90 per cent of which are SMEs. This includes the impact of online review sites on restaurants, hotels, attractions and other hospitality providers. The British Hospitality Association (BHA) has today, Thursday 16 November 2017, published this year’s annual report for the Food Service Management sector, ‘Leading Through Unprecedented Change and Uncertainty: Food Service Management Market Report 2017’. The APPG for the Visitor Economy, for which The British Hospitality Association provides the secretariat, has published its Report on the inquiry into Coastal Communities. In association with KPMG, BHA have published a report which says that without future EU migration the hospitality sector faces a recruitment crisis, with upwards of 60,000 workers per year needed in addition to the ongoing recruitment of 200,000 workers required to replace churn and to power growth. The KPMG report says that hospitality and tourism will be affected by restrictions to EU migration more than any other sector. Following the economic downturn, labour productivity growth rates have been subdued across most major economies. However, over this period, the UK hospitality industry has returned the highest level of labour productivity growth of any industry – more than double the growth rate of the overall UK economy. The hospitality industry is the 4th biggest employer in the UK, accounting for 3.2m jobs through direct employment in 2016, and a further 2.8m indirectly. The industry generated over £73bn of Gross Value Added directly to the UK economy, and a further £87bn indirectly. This guide is intended to give good advice and practical tips to catering managers and chefs on how to provide healthy choices for customers and at the same time assist them in complying with their legal obligations.